Everyone has a memorable international tournament they look back on growing up. For me it was the 2002 FIFA World Cup™ in South Korea, when David Beckham’s penalty saw England beat Argentina before Ronaldinho’s free-kick sent us home in the quarter-finals. But Russia 2018 will without doubt go down as one of the most entertaining tournaments to date. The hosts kicked off the action against Saudi Arabia in a game that most thought would be a boring curtain raiser, but Russia had other ideas. Despite being the lowest ranked team in the tournament and few giving them much of a chance on their own turf, the Russians proved to be one of the surprises of the competition. An enthralling 5-0 demolition of the Saudis on opening night was enough to get us even more excited if we weren’t already and it paved the way for so many thrills to come. Fans weren’t made to wait long for the first high profile clash as pre-tournament favourites Spain and Portugal faced off a day later. It looked mouth-watering on paper and it certainly didn’t disappoint. The game had everything. That wondergoal from Nacho Fernandez and a rare mistake from David De Gea set the tone but Cristiano Ronaldo wasn’t to be upstaged, scoring the tournament’s first hat-trick and an iconic free-kick that will go down in history. The group stages continued in a similar fashion with the introduction of VAR at the tournament only adding to the entertainment. The system was brought in to eradicate controversial decisions but seemed to have the opposite effect, with referees running over to a screen in a cubicle to re-watch the action. At first there were cries it was being overused, but before long every throw-in given the wrong way had players drawing imaginary squares in what is now the infamous ‘VAR sign’. The first and perhaps biggest shock of the tournament came at the end of the group stages. World champions Germany had seemed to have stolen a place in the knockout stages before defeat to minnows South Korea. Needing only a point to qualify, Germany went 1-0 down before Manuel Neuer was dispossessed on the edge of the opposition box in the dying embers of the game. Heung-min Son ran on to the long ball to put the final nail in the German coffin and send Joachim Lowe’s side home at the group stage for the first time since 1938. The knockout stages threw together some massive ties and some fantastic matches, not least France’s 4-3 victory over Argentina when Kylian Mbappe announced himself on the world stage. England saw the draw open up as Spain were beaten by Russia on penalties, and both Switzerland and Denmark were also on planes home. Gareth Southgate’s side won on penalties for the first time at a FIFA World Cup™, but songs of ‘it’s coming home’ ended at the semi-final stage. I tipped Croatia to be the dark horses of the tournament and now I’m feeling rather smug – if anyone wants Saturday’s lottery numbers then get in touch. Zlatko Dalic’s side reached the FIFA World Cup™ final for the first time in the history of the nation, seeing off England and winning two penalty shootouts in the process. 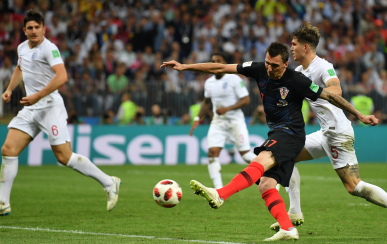 Luka Modric came away as the Golden Ball winner, but Ivan Rakitic, Marcelo Brozovic and Ivan Perisic were unsung heroes in what was a fantastic campaign for the Blazers. We won’t mention Peru, my prediction for the surprise package of the tournament. They arrived in Russia unbeaten since late 2016 but only managed one goal and crashed out in the group stages. Not my best prediction, I’ll admit. The tournament drew to a close after 63 games in 5 weeks that seemed to fly by in the blink of an eye. Eventual winners France overcame highly-fancied Belgium in the semi-finals in what I think was a match between the best two sides in the competition. Didier Deschamps’ side then saw off Croatia in a riveting final with six goals, a score line typical of such an exciting FIFA World Cup™. Every single game of the competition was entertaining, except maybe the only 0-0 draw between France and Denmark, and the tournament has certainly lived up to the hype. The FIFA World Cup™ may only come around every four years, but the brilliance of this summer’s instalment has already got us all thinking of the next one. The Armchair Reporter tuned into this summer’s tournament with the Official TV of the FIFA World Cup™, the Hisense U7A 4K ULED TV. Specifically designed to offer the greatest possible sporting experience, there’s no better way to experience every moment of the beautiful game, short of sitting in the stands! The official Armchair Reporter takes a look back at England’s performance at this years 2018 FIFA World Cup™ in Russia. Read the official Armchair Reporter match report for England’s loss against Croatia in the Semi-Final of the 2018 FIFA World Cup™. Read the official Armchair Reporter match report for England’s emphatic win over Sweden to secure their place in the Semi-Final of the 2018 FIFA World Cup™.